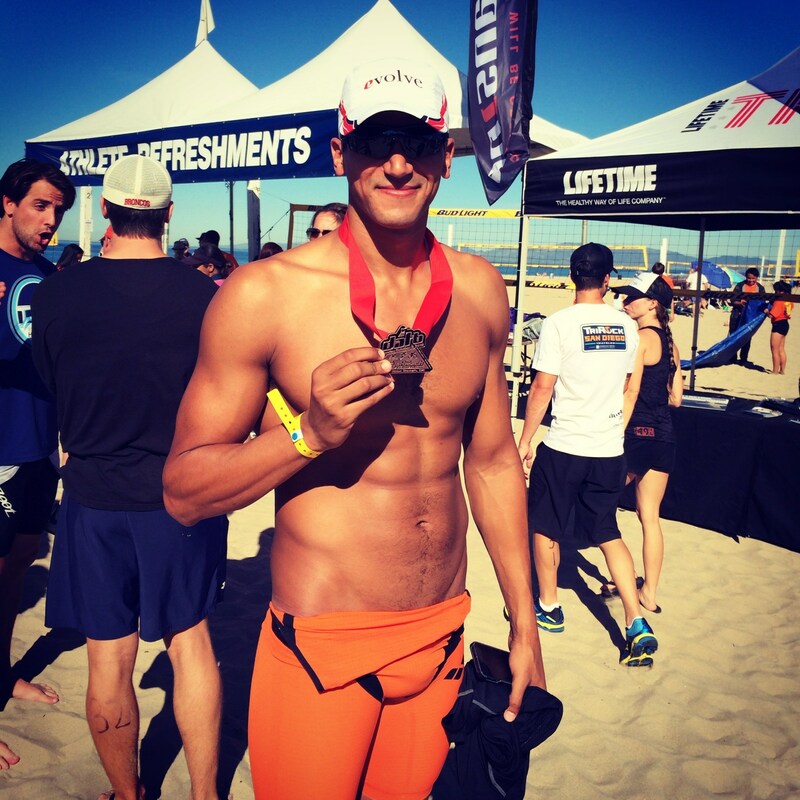 2-time Olympic Gold Medalist, Ous Mellouli, completed in his first ever triathlon over the weekend at ‘The Day at the Beach’ sprint triathlon in Hermosa Beach, California. Mellouli (a London Olympic Gold Medalist for Men’s Open Water and a Beijing Gold Medalist in Men’s 1,500 Meter) finished 12th overall and 3rd in the 25-29 Men’s Division with a time of 55:39 for the ¼ mile open-water swim, 10-mile bike ride, and 3-mile run. Next up for Mellouli are the Doha and Dubai stops on the World Cup circuit, followed by a trip to the Tokyo World Cup. The good thing is there is a whole lotta improvement potential from that 55:39. Good luck, it would be nice to see a swimmer cracking into the elite triathletes. It’s a huge hurdle since the swim portion is so small relative to the total time. 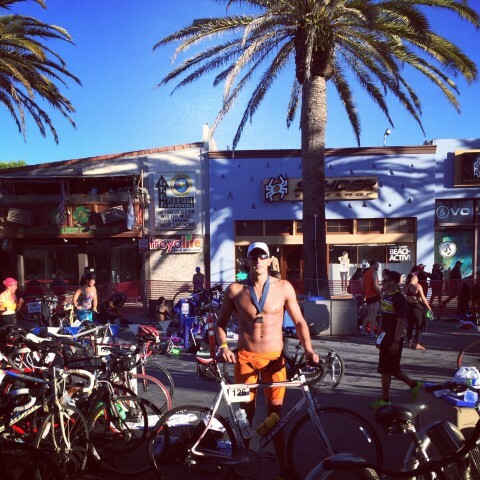 He seems to be on much better physical condition than at Barcelona.. if he keeps that.. medal contender again on 1500 and favorite for Open Water..
FYI Andy Potts, former swimmer from Michigan in the mid 90s is an elite Ironman triathlon competitor. That he is !! 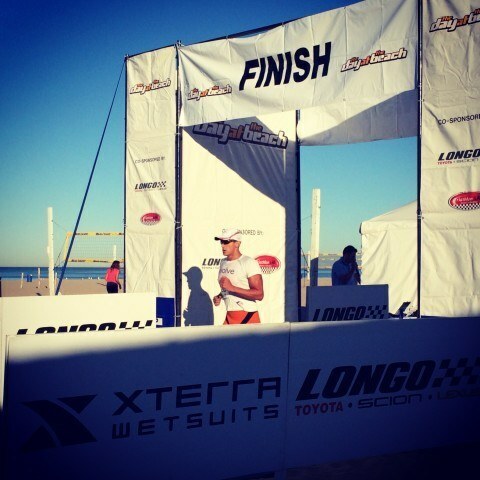 We need more like him and perhaps a bigger push to change the triatholon format to more an equilateral format. An idea proposed at times in the past, but hasn’t gone anywhere. Right now the definition of Triatholon or Ironman is “unfair to swimmers”. The running distance of the ironman is 48X the swimming distance. Should be for like 4X. Maybe OUS can go for the 3 sport medal in Tokyo. That would surely be a first, at least for a swimmer. Pool, Open water and Triathlon. Phelpsian type of feat!